Derrick A. Bonner was born and bred in Brooklyn New York and is the author of two outstanding novels, Alley Katt and Havoc and Mayhem. He self-published his first novel, Alley Katt, back in 1998 but shelved his second novel, Havoc and Mayhem. Twenty years later, at the request of his wife, he decided to finally put out his second novel. Set in the 80's the lead character Havoc is based on the strong influential men he grew up idolizing in his East New York neighborhood, as well as the lead character from his favorite television show as a kid, A Man Called Hawk. Played by Avery Brooks, Hawk was an impeccably dressed jack-of-all-trades, renaissance man who helped desperate people in trouble with nowhere to turn. His realness and black masculine presence on TV was rare then and still is today. "The thing about my characters is they are people we all know. We've seen them in the neighborhood doing good and giving back to the community. You ever knew someone who was ordinary but did extraordinary things and you were like wow? They seemed like they had super powers, but the truth is they were just good individuals. That is Havoc and Mayhem....That is Alley Katt." Derrick currently lives in Hudson Valley New York with his wife and two sons but still considers himself a Brooklynite. Because as he puts it, "You can take me outta Brooklyn, but you can't take Brooklyn outta me!" Havoc and Mayhem by Derrick A. Bonner is an urban fiction tale. It’s 1988 and Ronald Reagan is manning America’s helm. Rap music fills the streets and a brand new drug, crack, is causing serious problems in the street of New York City. Tommy Strong, AKA Havoc, is a Trouble Consultant who removes pimps, pushers, and punks from the streets for money. He loves his life and believes that nobody can touch him. Until the day his enemies band together to hunt him down. Left to look after his special needs sister, Havoc needs his best friend by his side to help him fight back and find out why he’s been targeted. Car chases, bloody fights, and shootouts ensue as Havoc and Mayhem hit the floor running and fighting to survive. 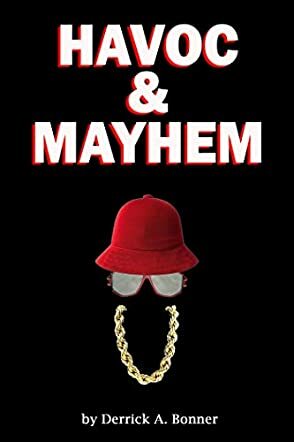 Havoc and Mayhem by Derrick A Bonner is hilarious, although a little violent at times but nothing too bad. It has a great plot, written in a descriptive and tight style. There is plenty of action at every turn and the story moves forward at a steady pace; there aren’t any dead-ends that lead nowhere, and everything takes us in a single-minded direction towards the finale. The characters are exceptionally well developed so that by the end we know all about them, who they are and what drives them. They are likable and easy to bond with, the kind of people you want in your corner! Great story, original and refreshing. I’d like to read more of Havoc and Mayhem in the future! This novel is everything from humorous, witty, action pack with twist and turns just about every page, paragraph, sentence. I read a review whereas the reader compared it Power meets Marvel Universe which is very accurate by it was the “Back To The Future “ popular cultural events that he touched on that had me feeling as if I was in 1988 that did it for me. I mean the author captured a time in Hip Hop culture that most so called scholars and historians will debate about. He even managed to talk about politics and cleverly reference Reganomic and how it targeted and destroyed a certain group of people through class warfare. You don’t have to be from the 80’s era to read and appreciate this masterpiece. You do however have to be from the 80’s era to appreciate how he captured a period of time and use that time period in the action pack, page turning novel that reads just like a screen play. I already see these characters in my head as vivid as he described them. My only bad critique is that once the book is over you stuck wanting to hang out with the characters luckily for me I have the option of reading it again which is exactly what I decided to do. Great Job author Derrick A. Bonner write -on good brother I will anticipate more of your work with I will support. I can also see you are a giant amongst ants in this new aged literary game. I cant wait to read this. Looking forward to reading and reviewing your work. Your book sounds very interesting. Cant wait to read the entire series. This is book is fiyah!!!!?? I love this book it took me back to high school days n I'm a die hard old school hip hop fan. Keep u the good work and continued success to you. Cant wait to read major and havoc. First let me say congratulations on your success thus far and may it continue to exceed your greatest expectations. First and foremost I would like to thank Derrick Bonner for coming out with another book. I have read Alley Katt and it was a straight page-turner. great book and was eager for the next one. I am now in the middle of Havoc and Mayhem and I have to tell you I can relate to a lot of stuff in this book and again a great page Turner. Congratulations on this. Keep on pushing. Excellent read had me wanting to complete the book I have to get it and I know it doesn't stop there please tell me there's a part 2 3 4 or maybe even 5 HELL it's that great!!!! Havoc and Mayhem is nothing less than amazing. You have a very unusual way of telling a story. The character development blended with vivid descriptive style of writing makes you a very unorthodox Author. Havoc and Mayhem reads like and action-packed movie and reminds me of the TV show Power meets Marvel. I can honestly say you studied your craft because you are witty and clever in how you are able to tell this story. I will be on the look out for more of your works. This book will make you nostalgic...it is wonderful and exciting read, a page turner. The writer pulls you in and takes you to Brooklyn. Being Brooklyn born and raised myself i can honestly say Bonner captures the essence of Brooklyn. Reading Havoc and Mayhem brought to memory great places and fun times I had as a child,/teenager in East New York/Bedstuy Brooklyn. The music intro alone in chapter one takes me back to jam sessions in the park...I had to listen to music from my grandmothers stoop because i was to young to be in the park after the street lights came on...lol. If you have not purchase a copy i recommend you do so ASAP.